1. Preheat oven to 350°. 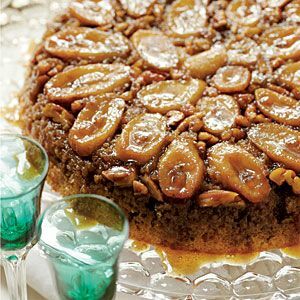 Bake pecans in a single layer 8 to 10 minutes or until toasted and fragrant, stirring once. 2. Melt 1/4 cup butter in a lightly greased 10-inch cast-iron skillet or 9-inch round cake pan (with sides that are at least 2 inches high) over low heat. Remove from heat; stir in brown sugar and rum. 3. Cut bananas diagonally into 1/4-inch-thick slices; arrange in concentric circles over brown sugar mixture. Sprinkle pecans over bananas. 4. Beat granulated sugar and remaining 1/4 cup butter at medium speed with an electric mixer until blended. Add eggs, 1 at a time, beating just until blended after each addition. Add milk and next 2 ingredients; beat just until blended. Beat in baking mix and cinnamon until blended. (Batter will be slightly lumpy.) Pour batter over mixture in skillet. Place skillet on a foil-lined jelly-roll pan. 5. Bake at 350° for 40 to 45 minutes or until a wooden pick inserted in center comes out clean. Cool in skillet on a wire rack 10 minutes. Run a knife around edge to loosen. Invert onto a serving plate, spooning any topping in skillet over cake.